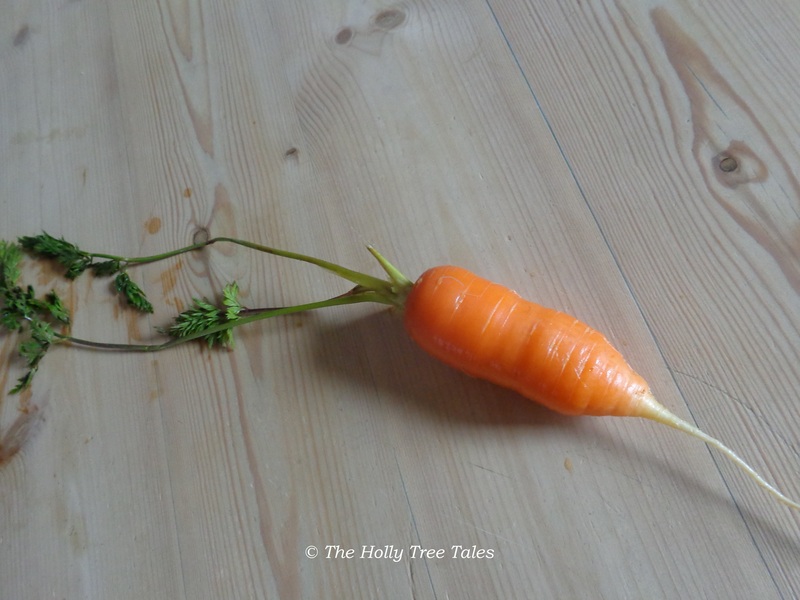 A healthy, juicy, over-Wintered organic carrot. There is something rather wonderful about going outside to attend to something, rugged up warmly against the cold, taking a detour into a protected area of the garden to see how it has fared in the icy cold weather, and discovering signs of life in a large pot of soil … then curiously scratching beneath the surface, to see if any of the wilted leaves are attached to anything of note, and pulling up a healthy, beautiful, organic vegetable! That is precisely what happened for me this afternoon, and it’s hard to describe the elation I felt at not only discovering a juicy, impromptu treat, but that the carrots my son and I had sown and grown last season had continued in strength throughout the Winter! To be honest, I had fully expected to find that those carrots, which were still left in the large container of our gardening experiment, would be completely decimated by now … instead, the soil around the remaining carrots was soft and crumbly, and the prize that was yielded today was absolutely delicious! Luckily, I photographed it straight after I’d washed the soil off this carrot, so that I could share my happy discovery. There is more to this story that is amazing than merely the chance discovery of a carrot, even more than the fact that the carrot survived the British Winter (although that is wonderful and symbolic in itself). During the Summer before last (2013), I had filled the huge, black plastic planter pot (in which we’d bought a silver birch tree, since planted) with any number of weeds and old potting mixtures and other garden ‘stuff’, whilst tidying in a little courtyard area near the house, where I keep my treasured pot plants and several roses and other herbs. My experiment was to see if the heat of the decomposing plant material could help to nurture and grow food for us. Having been given a courgette seedling, and not knowing where to grow it with enough heat, I had covered the top of the black pot with a black bag, cut a hole in the middle, made a space for the courgette seedling, surrounded it with fresh compost and stood back … to cut a long story short, we delightedly harvested courgette from that pot! Some months later I decided to take the experiment a step further, working with my son during his Spring school holiday, so that he could learn from it too. We added a layer of molehill soil to the contents of the pot, which had been resting, and carefully sowed organic carrot seed … towards the end of Summer, we were picking our own tasty little carrots! Summer 2014 ended, my children went back to school and university, the weather closed me in, Christmas came, the freeze came, snow occasionally still comes … and I hardly spend any time outdoors at the moment, because I am made for warmer climes. So, nipping out today and discovering that a little carrot had survived the northern Winter, in a plant pot, despite all seasonally challenging conditions, gave me a tremendous boost! and I am certain that there are more lessons to glean from this experiment yet!